Cream butter and brown sugar together. Add in egg and molasses. Combine the flour, ginger, cinnamon, baking soda, salt, nutmeg and gradually add to the wet ingredients until mixed well. Refrigerate the dough for 4 hours or overnight. Once it has chilled and has set out to become malleable, preheat the oven to 350 degrees. I honestly love your cookies. Perfectly decorated cookies are not in my skill set, so I thoroughly appreciate your messing piping, not to mention they look fantastic. Sometimes imperfection is perfect. It’s hilarious how angry your Santa looks. 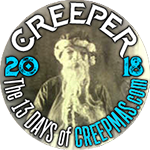 Previous Previous post: 13 Days of Creepmas!